I'd alos recommend you check out MY Youtube Channel by clicking here. 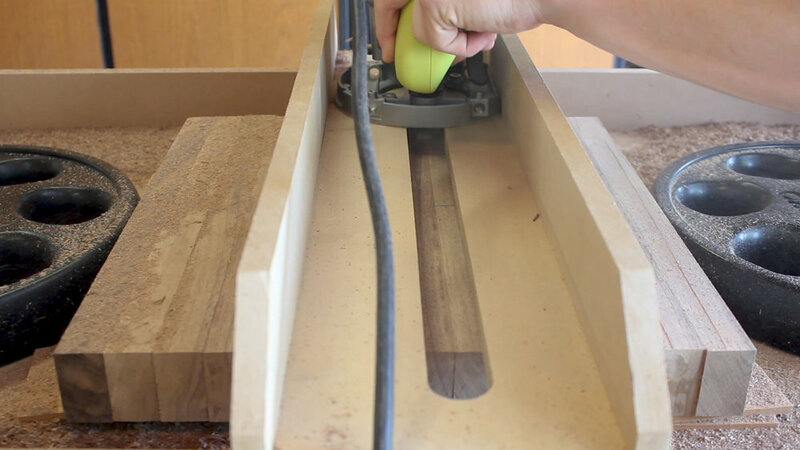 As I explain in the video, I had my local hardwood dealer plane both surfaces of the lumber I purchased as well as joint one edge. This cost me $15 total - and it saved me from needing to have any of that larger equipment, which, at the time of building this, I did not have (and still don't have). So, with my material prepped and ready, I could begin by cutting my pieces. I first measured and cut my material to 15" increments on the Miter Saw, which is easy when you set up a stop on the stand. I ended with 7 15" pieces and one that was about 12 inches that I used as back up but did not need. 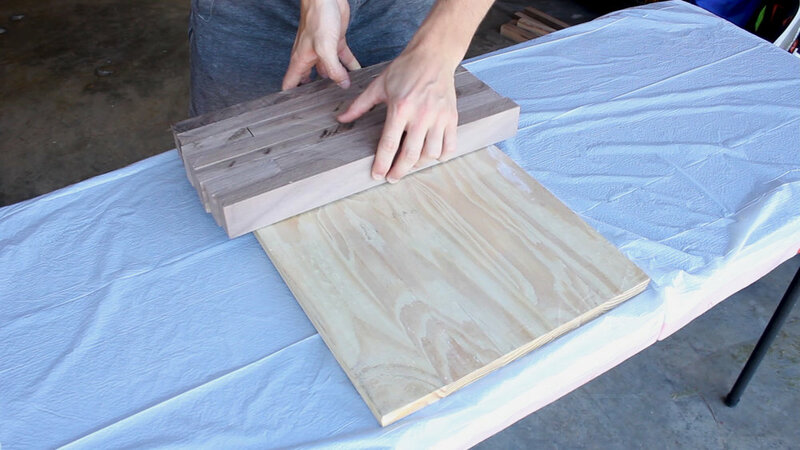 Butcher blocks are made up of many strips, so the next step was to set up a width I wanted to cut my strips to (I did 1.8") on the table saw, and repeat the same cut until you have enough pieces to make your project work. Since my pieces were 5/4 stock that had been planed, they were just a hair over 1" thick. This meant I needed 14 pieces per night stand to get a 14" x 14" size. Again - this was bespoke to me but you get the principal. The last photo shows how I divided my 28 strips into two equal sets of 14 pieces. Next, I marked random locations for cuts to be made. 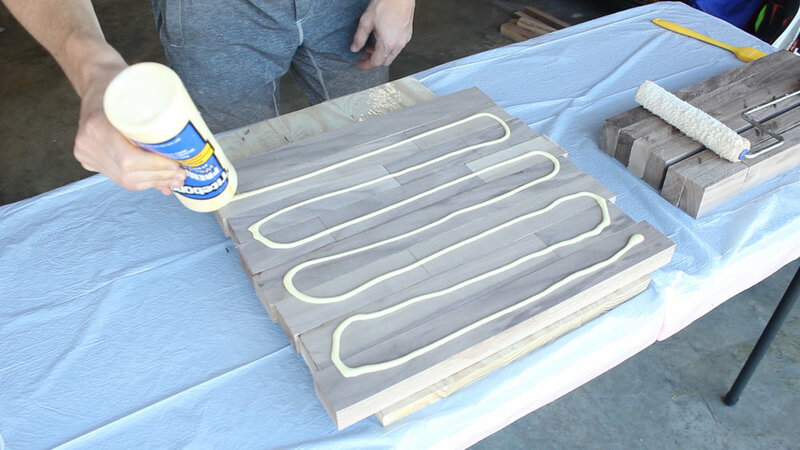 Butcher blocks look like they do because they are composed of many small strips glued up, but not in a uniform fashion. So, I just freehanded this (first photo) and then made a "V" on the pieces to be able to line them back up if needed. Then, I just made repeat cuts on my Miter Saw along all of the various lines I marked (Pic 3). Last, I could then go back and flip random pieces over, rotate, etc. to help mix up the grain variety. This step is totally optional but I recommend it for cool aesthetics! 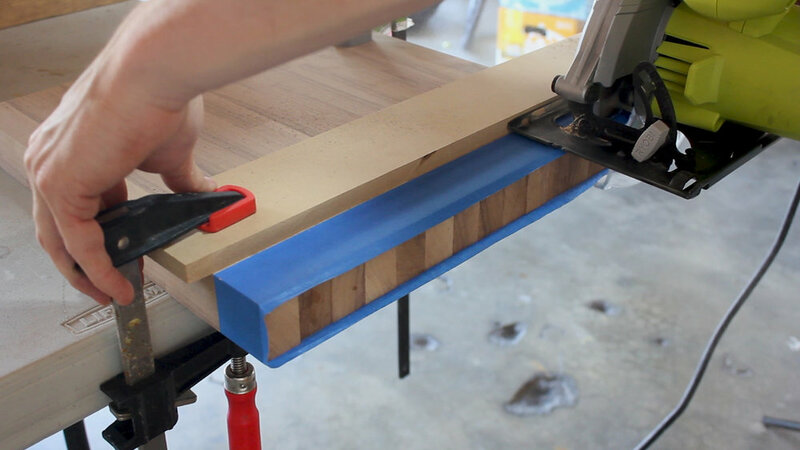 I put masking tape over a piece of scrap wood so that I could glue up my tables on top of it and not worry about the glue sticking to the wood. I'd never done this before but it works great and I'll do it moving forward! NOTE - I did do my best to keep everything flat, but my plan to flatten these properly was to use a router sled, so I didn't bother with any caul's or other methods to keep totally flat. If you have any questions about that - just shoot me a note and I can explain. 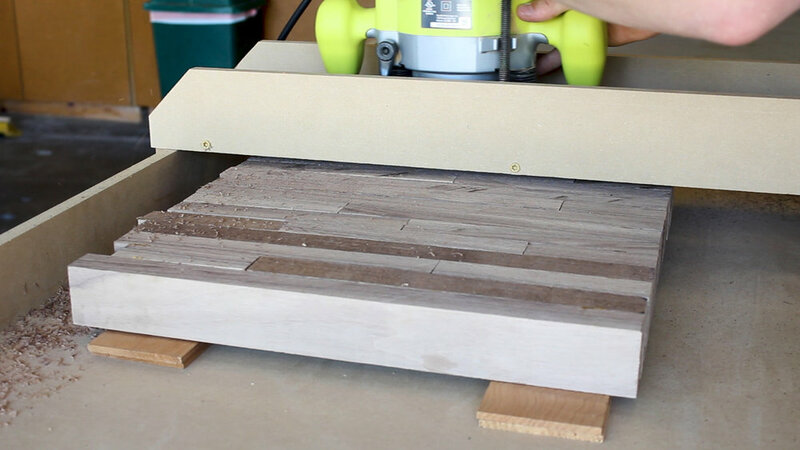 I built my own router sled that allows me to surface plane pieces up to 23.5 inches wide using a dado bit and my plunge router. It cost me about $20 to make in materials and works so well I'm going to have a hard time communicating just how well it does work! The router sled worked so well for me that I was able to do one pass at 120 grit on my orbital sander, followed by one pass of hand sanding at 220 grit to smooth it out and then take down the sharp edges slightly. Last up, using masking tape and a straight edge with my circular saw, I squared but both sides of each of my tables. The masking tape is to avoid tear out. I marked in 1.5 inches on all sides, and using my rafter square, made sure everything was squared up. I then marked circles for all of my holes, and then pre drilled all of my pilot holes using a 3/32" bit and a piece of tape to help gauge my depth drilling (don't want to drill through on these!). Then, using the hardware provided, I attached each leg one by one. 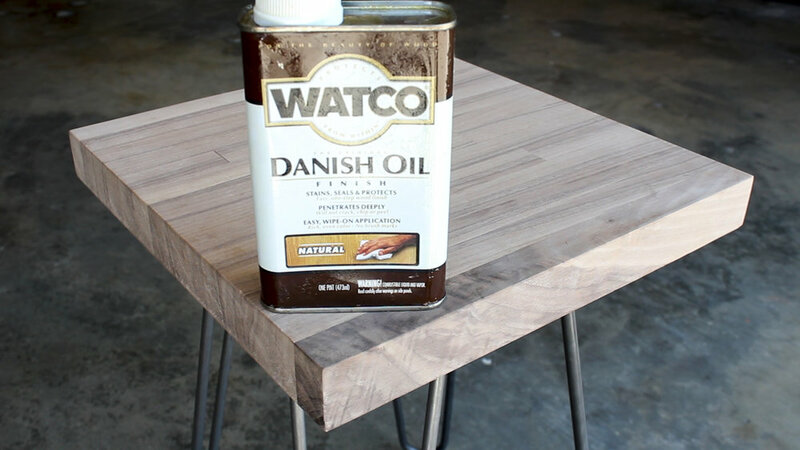 I love using Danish Oil on pieces as it cures well, protects the wood, and gives you the ability to "touch" the grain as it soaks into the wood, not on it. I did two total coats (only one is shown here), and my god did these things look awesome once I did that! 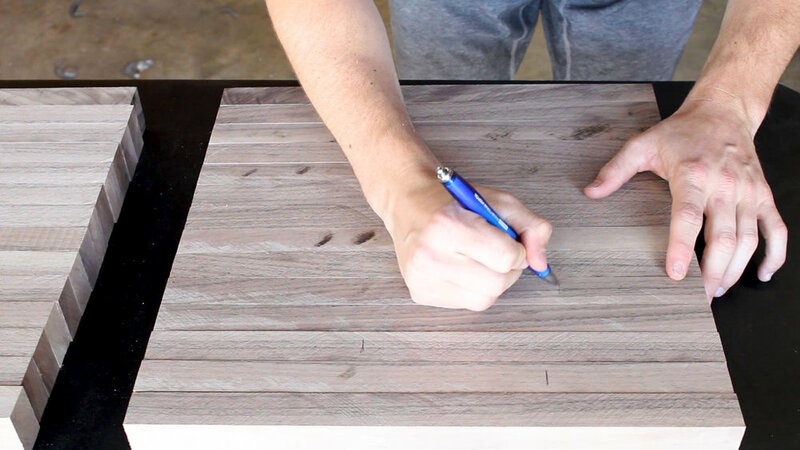 This is one of those projects where the end result is so good, you can look back and track your progress that lead to you being able to create something so refined looking. From the clean cuts to the excellent glue up to just how flat and smooth these things are, I am very proud of my work and a bit jealous that I now have to give these away to my friend. As always, thank you for reading! I would be so grateful if you could subscribe to my Youtube Channel for future projects.